There are many options for low-carb salads and this one takes the cake – coming in at just 5g of carbs. 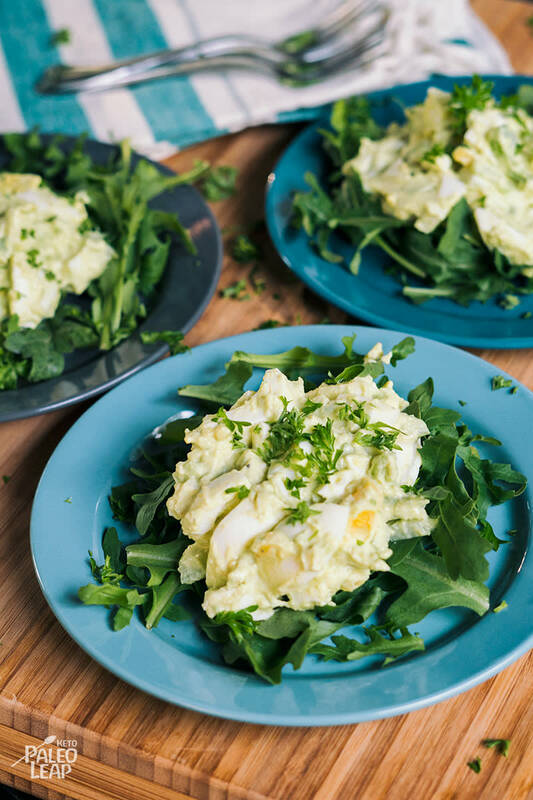 If you are really watching your intake, or are just in need of a low-key day, know that this keto avocado egg salad is just the one to keep your numbers right where they should be. As a bonus: it is incredibly easy to make, you can store it in the fridge till you are ready to eat and it just so happens to taste pretty darn good too. For a successful egg salad it takes mayo, there is no substitute for the real thing. Here is how to make homemade mayonnaise from the comfort of your own kitchen. It is a recipe that you will want to memorize, because it is ultra-useful in many dishes, it also makes a great base for a dipping sauce – just saying. As far as quality of eggs, seek out free-range if you can find it, opt for organic and if duck eggs happen to be available near you, then try them out too – the rich yolk will become a lovely reddish-orange hue when cooked and add some additional color interest to the plate. You can scoop the egg salad onto a bed of fresh leaves, or concoct a fancy lettuce wrap. When in doubt, a rasher or two never hurts to protein it up a notch – just fry it well and sprinkle the golden crumbles on top. Bring a pot of cold water to a boil, making sure there is enough water to cover the eggs. Drain the hot water from the eggs and run cold water over them. Peel and cut eggs into big chunks. Mash the avocado in a bowl; mix in the lemon juice, mayonnaise, mustard, and season to taste. In a bowl combine the eggs, celery, and avocado-mayonnaise mixture.